The new Toyota Auris Hatchback is the safe choice in a sector where dependability, reliability and predictability are welcome attributes – and which the Toyota has by the bucket load. It’s also practical, and affordable to buy and run. If stress-free driving sounds like your kind of thing, the Auris is a good option. It lacks flair and won’t excite you, but there is nothing fundamentally wrong with it. In many ways, it’s a complete car. OSV takes a closer look at what it’s all about with our 2017 Toyota Auris Hatchback review. There isn’t much fun to be had behind the wheel, but the Auris is nevertheless highly capable. Its stiff suspension of last time has been softened so that the car is able to deal with poorer surfaces better, while the car’s vague steering has been given an injection of feel. The standard manual transmission is perfectly fine; it’s accurate and light, and helps to keep fuel economy respectable. In terms of its engines, a 1.33-litre petrol unit kicks things off. It’s an old power plant that shows its age when compared to rivals, but it still has enough in its tank to get you from a standstill to 62mph in 12.6 seconds. A newer 1.2-litre petrol engine is a more attractive choice. It develops up to 114bhp, races from rest to 62mph in 10.1 seconds, and gets an extra cylinder. This ensures that it’s not as noisy as the other entry-level engine, and its extra punch means it’s easier to drive. A 1.4-litre engine sits at the bottom of the diesel range. It has more straight line speed than the entry-level petrol engine on paper but manages to feel slower in real life. It’s worth overlooking in favour of the bigger 1.6-litre diesel that does 0-62 in 10.5 seconds. It’s only a tad more expensive to run and has significantly more pulling power, which makes overtaking on the motorway easier. A hybrid engine rounds the range off. It has almost the same economy as the 1.4-litre diesel, can do 0-62mph in 10.9 seconds – but there are better, smoother hybrids out there. 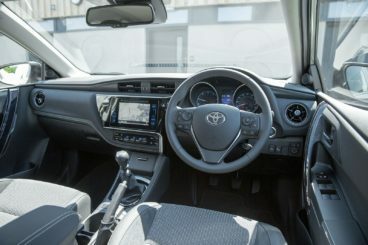 The Toyota Auris Hatchback is able to boast a well-built, smartly appointed interior that looks modern enough. Go for the Excel model, and you’ll benefit from part-leather upholstery that has a real sense of occasion, too. Plastic quality overall, though, isn’t good enough to make it feel upmarket, but it’s par for the course in this class. Its design is good, though, and there are even stylish flourishes here and there that the car’s bland exterior hardly prepare you for. The 7” touchscreen infotainment system looks good and is easy to use, and it helps to bring the car up-to-date with rivals. The steering wheel is reach and rake adjustable, while the driver’s seat adjusts for height. This makes it easy to get comfy for the driver, and it also boosts visibility. The cabin is well insulated, but adding the CVT auto transmission will cause the engine to make a fair amount of noise when you work it hard. In terms of how practical the Auris is, it’s competitive. There is no transmission tunnel, which means legroom is fine for all, while headroom is decent unless you add the optional panoramic sunroof. The rear bench is reclinable, while storage spaces include door pockets, a big glovebox and sizeable cup holders. The boot, meanwhile, measures 360-litres. It can be extended to 1,176-litres, and comes with a false floor. The entry-level model is well-equipped and comes with heated door mirrors that are also electrically operated, hill-start assist, LED daytime running lights, steel wheels, and automatic air conditioning. The Icon model adds 16” alloys, a 7” touchscreen infotainment system, Bluetooth, and a rear view parking camera. The Business and Design models add the likes of sat-nav, cruise control, 17” alloys and blue checked-cloth upholstery, while the Excel trim rounds things off with intelligent parking assistance and part-leather upholstery. To upgrade to a full leather interior, you’ll need to pay £950. In terms of its standard safety kit, the brand’s Safety Sense is available on all models except the entry-level ones. We suggest adding it, as it’s a pack that adds a bundle of advanced safety tech, including a crash-avoidance system. That aside, all models get a pair of ISOFIX child-seat mounts, electronic stability control and 7 airbags, while the Toyota Auris Hatchback scored 5/5 when it was crash tested by Euro NCAP. Prices for the new car start out from £16,655 and rise to £24,725. If you prefer to lease, you can pick up a deal from £224 + VAT per month. For more information on our leasing deals, check out our page here. In terms of its running costs, are models are affordable to run. The smallest petrol engine (1.3-litres) can return 51.3mpg economy at best, but the bigger, turbocharged 1.2-litre petrol is good for 58.9mpg and emits just 112g/km of CO2. The 1.4-litre diesel engine steals the show, however, with returns of 80.7mpg. That’s the same numbers returned by the hybrid, while the 1.6-litre diesel averages 67.3mpg. All models cost £140 a year in road tax, while where insurance is concerned, the eentry-levelmodel sits in group 6 and the range-topper occupies group fourteen. If running costs are a priority of yours, the Auris is a strong choice. All its engines return well over 50mpg, with the smallest diesel returning 80.7mpg. Toyota have an unmatched reputation for reliability, and this is a family car that won’t let you down whether you’re close to home or miles away. The Auris’ 1.2-litre petrol engine is modern, clean, performative and returns almost 60mpg. The Auris’ biggest limitation is its bland looks. In terms of quality, the car can’t compete with its more upmarket, cosseted rivals. 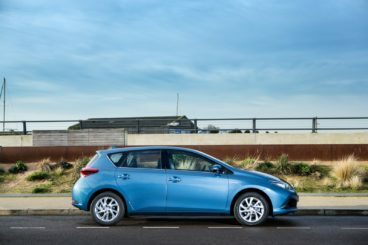 Let’s see how the car fares against its rivals in the comparison section of our 2017 Toyota Auris Hatchback review. The new Nissan Pulsar Hatchback is refined and spacious, but might be a bit too serious for some buyers. What do we mean by that? Well, like the Auris, it just isn’t much fun on the road at all. Although it’s easy enough to live with in the town, its driving experience is best described as dreary. That said, there are still things to like about it. For example, families will be pleased with the amount of grip on offer, and the steering is nice and direct. On the other hand, body lean is excessive, and the steering wheel lacks feedback. In terms of its engines, high-mileage drivers are best advised to look at the 1.5-litre diesel engine. It’s a bit hoarse on the motorway, but it’s got enough power to make it reasonably responsive. Some buyers will be put off by the lack of an auto transmission, though. The smallest 1.2-litre DIG-T petrol engine is cheaper to buy and makes sense if you’ll be sticking to urban sprawls most of the time. It does 0-62 in 10.7 seconds and feels smooth. If you want more power, the bigger 188bhp 1.6-litre DIG-T petrol engine really ups the ante, covering the 0-62 sprint in 7.7 seconds before maxing out at 135mph. That’s quite fast, and economy naturally takes a hit the harder you rev it. Nissan reckon it can return 49.5mpg at best if you stick to the smaller wheels, but we think they’re being a tad too optimistic. The 1.2-litre petrol engine, meanwhile, averages 56.5mpg and emits 117g/km of CO2. However, by far the cheapest to run is the diesel engine, which returns close to 80mpg and emits less than 100g/km. Its fuel economy is the official figure only, and we’d wager it will average 60mpg in the real world. 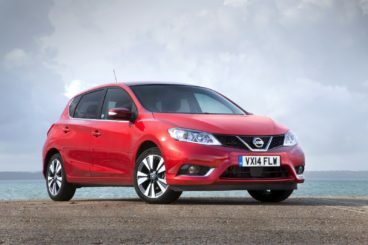 Inside, there are fewer – if any – hatchbacks that are more comfortable than the Nissan Pulsar. It might not be entertaining, but refinement and ride quality is second to none. Its soft suspension does an excellent job of cushioning you from lumps and bumps and insulation is for the most part, excellent. In terms of its design, the Nissan Pulsar Hatchback’s interior isn’t quite as bland as its exterior might suggest. This is largely thanks to the fact that it shares its layout with the funky Nissan Qashqai. That said, the onus is still very much on functionality, but leather seats boost its appeal. Is the Nissan Pulsar Hatchback practical? Absolutely. Its boring boxy shape means there is plenty of interior room, both up front and in the rear, and the car has the longest wheelbase in this sector. There is plenty of adjustabilities to help the driver get comfortable, rear seat space is class-leading, and the boot measures 395-litres. That’s competitive, and we like how deep and wide the boot is. The new Volkswagen Golf Hatchback is the fun option in this review. It’s a car you look forward to driving, offering as it does plenty of grip and precise steering. Moreover, body lean is kept to a minimum. Sure, it’s not as entertaining as, say, a Ford Focus, but there’s a lot of enjoyment to be had. In terms of its engines, a 1.5-litre petrol is brand new. There are 148 and 129bhp versions, and both impress. They come with cylinder-deactivation systems that shuts parts of the engine down whenever you don’t need full power. This helps with economy, but the engines are still performative. A smaller 1.0-litre petrol delivers just 84bhp, and while it takes 11.9 seconds to get from rest to 62mph, it feels sprightly and pulls away sharply. The diesels are all seasoned performers that won’t let you down. A 2.0-litre 148bhp variant can do 0-62 in just 8.6 seconds, but it’s the 1.6-litre TDI unit that will be the most popular with buyers. It produces 113bhp, and does 0-62 in 10.2 seconds. It’s the cheapest engine to run, with its automatic stop-start system helping it to return 72.4mpg economy. The 1.0-litre 84bhp petrol engine will suit city dwellers, and can return a reasonable 58.9mpg at best. With more power, the 1.5-litre TSI petrol delivers 126bhp, but still returns almost the same fuel economy. Inside, there isn’t much to fault about the Volkswagen Golf Hatchback. It’s comfortable, quiet, and VW haven’t held back in terms of the quality of its materials. It feels so much classier than the Toyota. The driving position is excellent, with height adjustment allowing anyone of any size to get comfy, ride quality is fine, and while there are hints of exterior noises get into the cabin, it isn’t enough to be a nuisance. The dash is well put together from top notch plastics that are of a higher grade than the Auris. There are metal-effect highlights here and there, as well as lots of soft touch finishes. 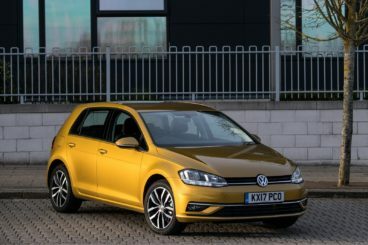 In terms of how practical it is, you can get the Golf Hatchback with either three or five doors, with the latter obviously adding a bit more versatility. It’s the practical touches in all models that we like; the boot comes with a 12v plug, the rear seats split & fold, and there are luggage hooks available as standard. We also like how the glovebox is air-conditioned. Three adults can sit in relative comfort in the back, while the boot measures 380-litres. If you fold the rear seats, it extends to 1,101-litres. The new Toyota Auris lacks the wow factor, but it makes up for it by offering everything else a family could ask for. It’s affordable to run, reliable, clean, usable and easy to live with. If you need aesthetic pleasure, you’ll have to look elsewhere. If, however, smart and sensible wins the race for you, the new Toyota Auris Hatchback is an excellent choice.